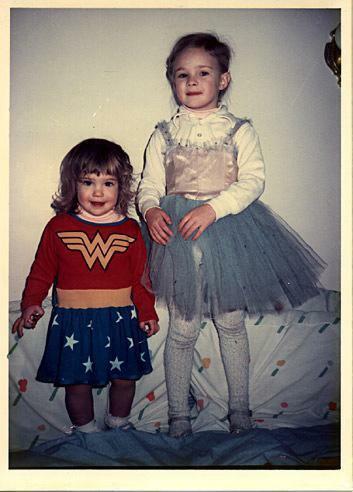 Flack with her sister (left) as a child. In 1990, when Boston Ballet began renovating its 19 Clarendon St. headquarters, the company and school temporarily relocated to my elementary school’s gymnasium in Newton. It was every 6-year-old girl’s fantasy come true. In between my first-grade classes, I’d peer down the long hallway and see these sinewy ballerinas glide past us on their way to rehearsal. They’d chat with one another as muffled piano music came from the gym. I would have done anything to be part of it. Some of the girls in my grade had signed up for ballet classes after school, and I begged my mother for lessons. But because I was an extraordinarily shy and nervous kid, I asked that she drive the 20 minutes to school in order to walk me down the long hallway to the gym. Because she is a good mother, she said I could take lessons only when I was ready to make the walk myself. It took me a year to muster the courage. Those first solitary steps were the beginning of a journey that would lead, ultimately, to a decade of intense training, followed by nine years of dancing with the New York City Ballet. Those experiences would also inspire a young adult novel, “Bunheads,” that I wrote after retiring from dance. Of those first months of ballet lessons, I mostly remember leaping over silk scarves imagining that I was a butterfly. We didn’t wear pointe shoes or tutus, but there was a pianist, and I was in absolute heaven. In school I struggled to learn to read, and when asked to read aloud, I often guessed words incorrectly. (I was later diagnosed with mild dyslexia.) I dreaded standing before the class and the humiliation that followed. But dancing gave me a sense of joy and pride like nothing else. I couldn’t get enough of it. Then one day, the barres and pianos were loaded onto trucks and the linoleum floor rolled up, and the gym went back to being used for dodge ball and rope climbing. School felt very quiet without the sound of that piano. After the company left, my mom began to drive me to ballet lessons at Boston Ballet School’s Newton studios. Carolyn Eaton, the director of the lower school, took an interest in me, probably based on my focus in class and my physique — I have hyperextended limbs and arched feet. She quickly ushered me into the “intensive track.” I didn’t have a real sense of what this all meant at the time, but I was on the path to becoming a professional dancer. I remember the very moment I learned how to dance. I was 8, a little over a year after I had begun taking lessons, and we were at the barre doing tendus in Jill Silverman’s class, when, for whatever reason, I imagined that I was a robot. I kept my body completely still while I jolted my leg into position, and then back into fifth. Ms. Silverman clapped her hands abruptly, and the pianist stopped mid-phrase. “Everyone look at Sophie,” she said. Thirty 8- and 9-year-olds in matching royal-blue leotards turned to face me. Ms. Silverman was stern, yet kind, and when she spoke, we snapped to attention. “Do it again,” she instructed. I pretended that my legs were made of steel rods and repeated the motion. I stood in fifth position, looking up at Ms. Silverman, waiting to be corrected. That was the first time I’d ever received praise for my dancing. More importantly, I’d learned that dancing was something that happened in your mind. I could control my muscles and modulate the quality of movement by using my imagination and my brain. I would rely on this concept for the next decade of training and through my career with the New York City Ballet. Flack at 12 when she was a member of the Massachusetts Youth Ballet. At midyear in the sixth grade, Ms. Eaton promoted me to the next level; I was to join Ms. Beckwith’s class with the older girls. I was excited mostly because this meant I got a new burgundy leotard as my uniform. With her blond hair pulled back into a neat ponytail, and a knee-length chiffon ballet skirt and leotard, Kristen Beckwith looked like a ballerina herself. We were in awe of her, and she taught us to move with regality and poise. At The Cambridge Friends School, I was the only person seriously interested in ballet. While the other kids in my class were curious about boys and concerned with being popular, I was on a mission that felt important. No one really understood where I went after school, or why, but I kept at it. The rewards for remaining focused and working hard were paramount. I was offered a full scholarship to the Boston Ballet School. Anna Marie Holmes, who was the company’s artistic director at the time, spotted me in class and called my mother to ask permission to coach me privately at the company’s Clarendon Street studios. Even though I was only 11 at the time, Ms. Holmes treated me like a true professional — and she expected me to act like one. She taught me pointe work and prepared me for international dance competitions. The hourlong coaching sessions were incredibly intense and exhausting. For the first time in my life I felt nauseous from dancing, but I learned to push though the fatigue. Looking back, I realize how unusual it was for the director of a professional ballet company to personally coach a child from the school and how lucky I was to have that kind of mentorship. That summer I went to sleep-away camp for the first time, to a prestigious ballet program in upstate New York called Chautauqua, where I performed en pointe for the first time. The feeling I got from being onstage was like nothing I’d ever felt before, and I wanted to continue to experience that rush as much as possible. At Chautauqua, I trained with former New York City Ballet principal Patricia McBride. She showed us a videotape of herself performing Balanchine’s “Tchaikovsky Pas de Deux,” and I was astonished that dancing could look like so much fun. I decided at that moment that I wanted to move just like that, and that I was going to dance with the New York City Ballet. While the idea of leaving my family scared me, I glimpsed a life and a world that I desperately wanted to be a part of. I would do whatever it would take to achieve my dream of dancing with one of the world’s greatest ballet companies. In the dressing room before a performance of “Swan Lake” in 2006. My mother and I would take occasional car trips to New York City so I could also train with two of the country’s top coaches, Nancy Bielski and Wilhelm Burmann. In their open classes at Steps on Broadway, I would dance alongside some of the ballerinas whose pictures I had taped to my ceiling. I was intimidated and found it difficult to keep up, but I kept coming back despite feelings of defeat and frustration. I realized that my dancing improved when I was around dancers who were stronger than me. As I watched and learned from them, I pushed myself even harder. When I was 14, I was accepted into the School of American Ballet summer program, and soon after was invited to stay for the winter program and awarded a full scholarship. I called my parents from a pay phone with the news. I was moving to New York City! Each morning I would walk five blocks from my dorm at Lincoln Center to my 10th-grade classes at the Professional Children’s School, then return mid-morning for ballet class, then back to academic school, then back to the School of American Ballet for variations or pointe. By my second year, I began to develop real control over my movement in a way that I hadn’t realized was possible. The director of the New York City Ballet, Peter Martins, would occasionally watch or teach class, and he gave me a lot of attention. But I knew that there were only a few available spots in the company for apprentices, so I was determined to be at the top of my class. In October 2000, I was awarded my apprenticeship with the New York City Ballet. It was the happiest moment of my young life. All of the hard work had finally paid off. During my nine years dancing in the corps of the New York City Ballet, I toured internationally and performed some incredible works. Like any career, it was not without its frustrations and struggles, but I wouldn’t have traded it for anything. I loved being sore, I loved the work, I loved the stage, and most of all I loved the music. The life of a dancer is a rich, never boring, ever-challenging adventure in the best possible way. I don’t know what my life would have looked like if the Boston Ballet hadn’t rehearsed in our school gymnasium, or if I hadn’t found the courage to walk down that hallway by myself. One thing I’m sure about is that my mom was right: I had to go it alone. To “make it” I had to ignore the impulse to go with the crowd and do what was considered popular or normal. And looking back, I suspect that my success was more the result of ambition and determination than talent or natural facility. When I was young I never considered what would happen if I didn’t make it into the New York City Ballet; to me it was the only path. But it truly took a village for me to achieve my dream. My parents sacrificed to make sure that I received the best training available, and my teachers pushed me to reach my potential. I would not have had my career without their support, guidance, and toughness, and for that I am truly grateful. I bow down in thanks like a swan folding its wings. I hope I was able to make them proud.